REGENSDORF, Switzerland – HARMAN’S Studer today announced that it has adopted the Axia Livewire™ AoIP standard. Livewire is the broadcast networking system which utilizes Ethernet to provide an easy way to route and share audio and logic throughout the broadcast plant. Under the Livewire Limitless License (L3) introduced this year, Studer is licensed to build a Livewire interface into any or all of its products, allowing instant one-cable connection to Axia networks and products from more than 30 other Livewire hardware and software partners. Studer recently launched the OnAir 1500 small footprint broadcast and production console, and the Vista 5M2-22, the smallest Vista ever produced. 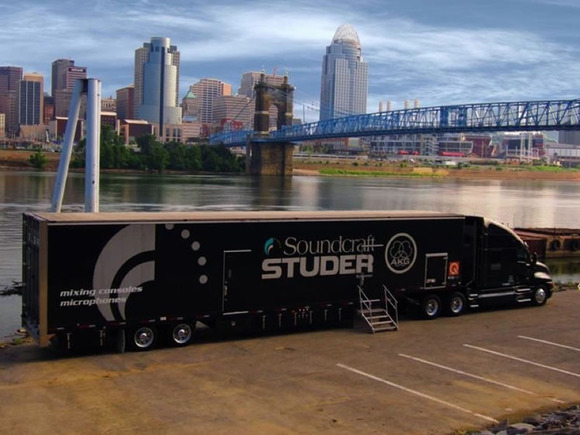 Both products can be seen as part of the Studer Broadcast Academy (SBA); a free training and broadcast engineer certification facility housed in a custom built, 73 foot long truck currently touring the USA, Similar training is offered at the Soundcraft Studer Customer Experience Centre and factory near London, England. For more details or if you would like the SBA to visit your location visit www.studer.ch or www.USA.studer.ch. Axia, a Telos company, builds Ethernet-based professional IP-Audio products for broadcast, sound-reinforcement and commercial audio applications. Along with the popular Element 2.0 modular console for on-air, commercial production, audio workstations and personal studios, Axia products include the PowerStation integrated console engine, intercom systems, digital audio routers, DSP mixers and processors, and software for configuring, managing and interfacing networked audio systems.